This warp started as a deflected doubleweave draft from The Deflected Doubleweave Handbook, which accompanies a video by Madelyn van der Hoogt, adapted to the yarns I had on hand when I began it while staying with my sister and with limited supplies. Deflected doubleweave is a weaving structure with separate yet interwoven layers where the movement of the yarns, once the cloth is off the loom and wet finished, creates new shapes, curves, even circles, and the front and back are different, sometimes very different. When I picked it up again after arriving in Swansea, with a different limited set of supplies, I wandered away from the pattern, trying different yarns, using up bobbins and experimenting to see what would happen with different combinations of fibre and pattern. I find the fibre interactions astonishing, what happens with the colours and the textures and how it can all shift into something so different. And even more than that, I am seeing so much potential in this weave as a metaphor for expressing the magical spaces that fascinate me – this world and the otherworld and the thin places between, those liminal borderlands and thresholds where one thing becomes another, the integration of images, ideas and emotions that seem to be in opposition but can be experienced as both/and, not either/or. 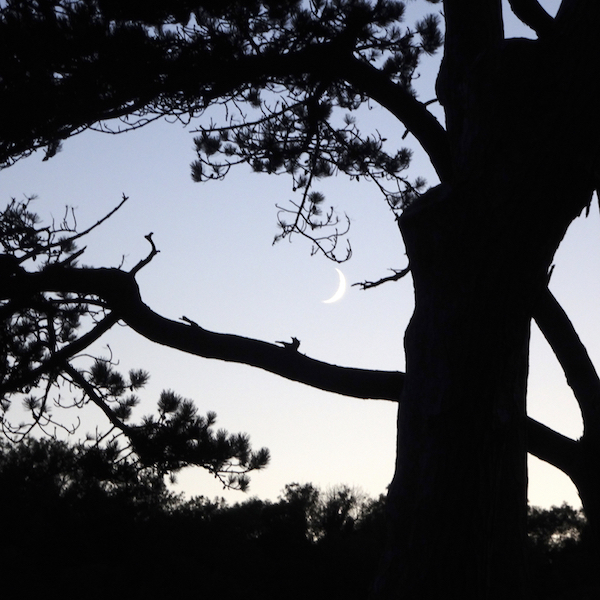 What Rowan Williams calls ‘a layered and broken reality’. I’m nowhere near the technical mastery to embody any of this in the weaving yet, but I mean to practise all I can, till I am able to break (or keep) the rules through choice and not through ignorance; and to explore the debatable land a little further with every warp. I have a doubleweave sampler on my table loom which I need to finish to free up the loom, and having gone through lots of exercises in the excellent book Doubleweave, by Jennifer Moore, I am playing now in a freestyle way with rags and scraps of yarn. 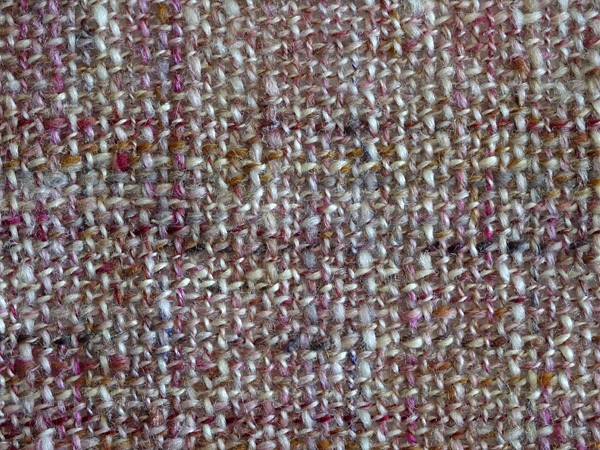 Doubleweave is woven in two layers, and it can be used to create a thick double cloth with both layers joined across the width, or it can be used to create a cloth that is wider than the width of the loom, by turning a corner at one edge so that the bottom layer is joined to the top layer all along that edge but nowhere else. Essentially you are weaving a piece of cloth that is folded in half and when it comes off the loom you can open it out to its full width. Here I’ve decided to divide the warp into short sections, weaving each with a different weft, I have 7 sections across the top (green) layer and three across the bottom (rust) layer – I thought 3 was enough of a challenge on the bottom, which I can only see by bending double and craning my neck or using a mirror – and by feel – ‘seeing’ with my fingers. It’s slow but satisfying to watch this cloth taking shape, and I’m not sure what will happen next, just weaving in the moment is enough. Doubleweave by Jennifer Moore – if you’re interested in the book I’ve been following, using this link helps to support my blog. Until I began weaving I didn’t appreciate how much of a transformation the cloth undergoes after the weaving ends. Wet finishing is a magical process that I enjoy every time. 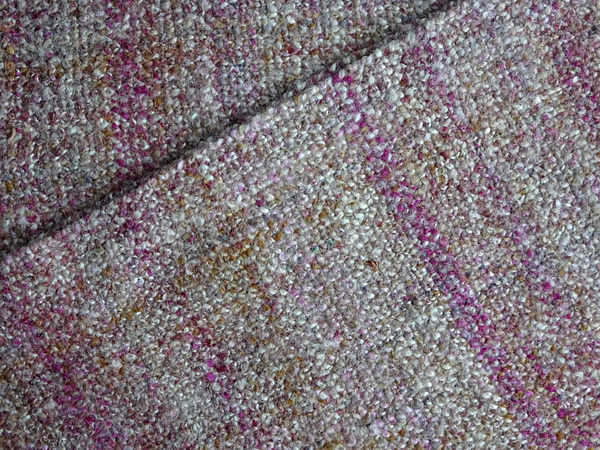 Watch what happens with this tweed scarf that’s entirely woven with my handspun yarn. 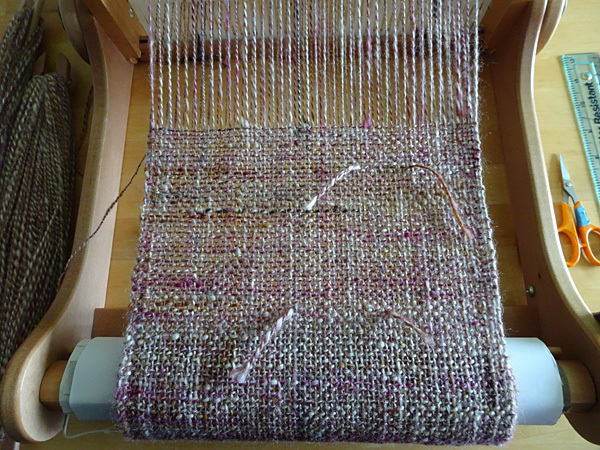 The warp yarn (end to end) is stretched, and I deliberately beat the weft yarn (side to side) lightly to create an open weave with lots of scope for shrinkage. This yarn, like much of the yarn I create for weaving, hasn’t been washed and set after spinning, so it hasn’t shrunk at all yet. Now I’ve cut the scarf from the loom and it’s no longer under tension: notice how the yarns are distinct and you can still see through the weave. The next step is to wet finish the cloth. For these scarves, which are mostly wool with a little silk, I start by running a bowl of hot tap water with a small amount of wool wash and soaking the scarf for at least 15 minutes. Then I work the scarf vigorously in the water, squeezing and pummelling, just the opposite of how to hand wash a finished scarf! I lift it out often to see how the fabric is changing. How long this takes depends on how fulled I want it to be. I’m looking for a change, from individual yarns that move separately, to a surface where all the yarn looks bedded together and the cloth moves as one. At that stage I rinse in cold water, then hot, agitating it more, and repeat as needed – watching the fabric carefully all the time. This is to shock and shrink the fibres further, just like fulling felt. You can always full it more if the finished cloth isn’t quite what you are aiming for, but you can never ‘unfull’ it, so it’s important to pay attention to what is happening or the fabric will get too solid and lose its drape. Once the scarf has reached the texture I want, I stop fulling and place it into a bowl of lukewarm water with a splash of vinegar to neutralise any remaining wool wash. Then a final rinse at the same temperature, squeeze out the water gently, roll in a towel to absorb as much moisture as possible, and hang to dry at room temperature. 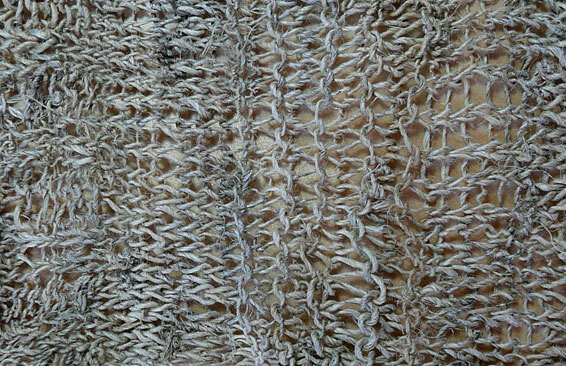 This is the cloth after wet finishing: see how the yarn has bloomed and shrunk, closing the gaps to form a textural, nubbly cloth. You can still see through it a little, but only if you hold it up to the light. Once the scarf is dry or almost dry, the final step is to iron it. 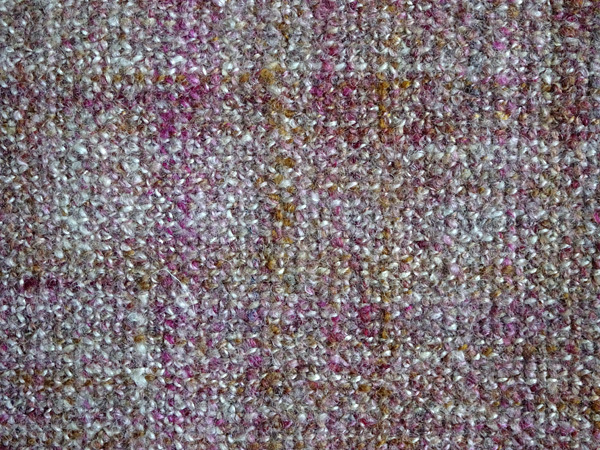 This creates the lovely tweed surface, bringing out the sheen of any silk or lustrous wool I may have used. After this I can really say the scarf is ‘finished’. I use a steam iron on the hottest setting (with a pressing cloth to protect the woven fabric) and press as hard as I can all along the length; then turn it over and do a lighter press on the other side. And the finished scarf is now ready to wear. 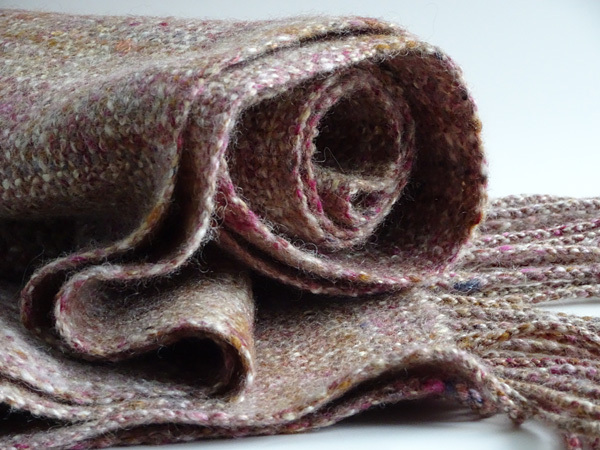 Visit my shop on Etsy to see more handwoven, handspun scarves. For those who can access the BBC, a new TV series coming up on BBC4 sounds interesting – a “series of three documentaries exploring Britain’s relationship with fabric, featuring knitting, needlework and wallpaper.” It starts on Wednesday 18th with ‘Knitting’s Golden Age’. Thanks to Journal for WS&D on Twitter for this.